Meat and potatoes is a traditional combination, and few dishes bring out the best in both ingredients like a good stew. Choosing the right potatoes for stew is the first step to success. Russet potatoes work well for thick, tomato-based stews. Red potatoes and new potatoes hold their shapes well, and their delicate texture complements lighter, broth-based stews. If you choose baking potatoes such as russets, cooking stew potatoes should be done separately to avoiding adding too much starch to the broth. Raw red or new potatoes can be added 15 to 20 minutes before the stew is done. Wash your potatoes thoroughly and remove any bruises, eyes or other blemishes. 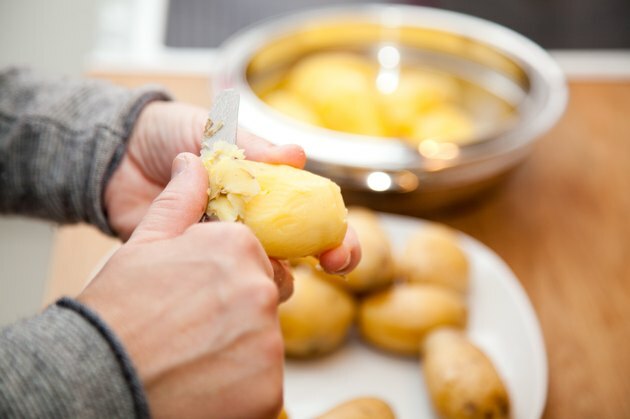 Peel the potatoes with a potato peeler or knife. Use a light touch so you get the peel without removing too much actual potato. It is not necessary to peel red or new potatoes. Cut the potatoes into bite-size chunks. The smaller they are, the faster they will cook, so don’t make them too small. Place the potato chunks in a colander and rinse them well under cool running water. Set red or new potatoes into a bowl of ice cold water to keep them from becoming discolored at this point, and let them sit until it is time to add them to the stew. Put all of the potatoes into a large pot and add enough water to cover them with about 1/2 inch of water to spare. Salt the water lightly. Bring the pot to a boil over high heat. Turn the heat down to a gentle boil and cook the potatoes for 10 minutes. Stir the potatoes and check for doneness. Potatoes should be added to stew just before they are done to keep them from falling apart, so poke a fork into a chunk. The tines should meet slight resistance. Check every 5 minutes until they are barely done. Drain your potatoes in a colander and add them to your stew. Return your drained potatoes to the cooking pot and place a clean dish towel over them for 5 minutes to steam out any extra water. Add carrots, celery and other vegetables to the stew at the beginning so they will be almost cooked when you add the potatoes. Do not overcook potatoes for stew or they will fall completely apart.